Beer, single malts, red wine, fine food and travel. When 25 different varieties of leaf hops are being rubbed at once, releasing essential oils and volatiles, the air at the Black Oak Brewery, Toronto, was redolent with pungent aromatics of spicy Comet, earthy English Fuggle and floral Legacy hops. Palms were turning golden and green in equal measure as attendees at the second, ‘We love hops technical event’, gleefully rubbed their way to release the heavenly compounds of hops. 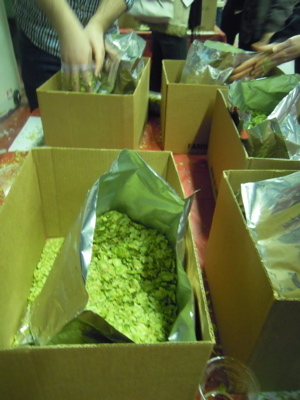 Hop rubbing is quite simply the best way to get to know what a particular hop variety has to offer the brewer. 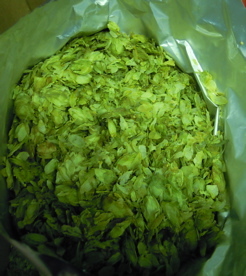 By placing a few hop cones in the palms of the hands and rubbing vigorously, literally pulverizing the cones, and then cupping the hands to contain and direct the resulting aromatics directly into the nose, is a technique that never fails to deliver the goods. Nicholas Schaut, president of The Ontario Hop Growers Association, spoke on behalf of the 18 hop growers who are working diligently to grow the industry in this province. This was followed by Evan Elford, OMAFRA, speaking about the need for hop research in Ontario and relationship building between microbrewers and hop growers. Following some tasty burgers catered by Brock Shepherd of the Burger Bar of Toronto, Diana and Stacy Puterbaugh, Hops Direct of Washington, spoke about the U.S. Hop Acreage Report and hop growing techniques. Seven unique single-hop beers and Black Oak Pale Ale and Nut Brown, as well as Augusta Ale from the Kensington Brewing Company were available for sampling. The well attended event was organized by Bob Latimer of Beer and Wine Filter and importer of Puterbaugh hops, and James Tien of the Muskoka Brewery in Bracebridge.